This summer, the Ida Lewis Distance Race will celebrate its tenth anniversary doing what it does best: presenting sailors with an exciting overnight offshore experience that covers hallowed sailing ground and is just the right length – not too short, not too long – for all types of competitors. On Friday, August 15, the race starts off Ida Lewis Yacht Club in Newport, RI and takes its fleet of IRC, PHRF, One-Design, Double-Handed and Multihull boats on coastal courses chosen from four options with distances between 104 and 177 nautical miles. Among the iconic waypoints are Castle Hill, Brenton Reef, Block Island, Montauk Point, Martha’s Vineyard and Buzzards Bay. 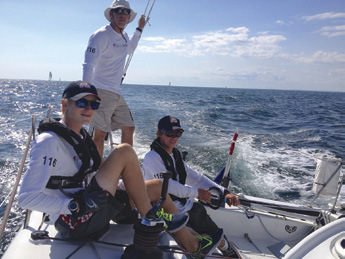 George Moss (foreground) onboard the Ida Lewis Yacht Club’s 2013 Youth Challenge entry, Class40 Icarus Racing. “Over the course of a weekend, you can race against a number of spectacular sailors and experience a variety of weather conditions on a beautiful and challenging offshore race that starts and finishes in Newport,” said Chris Culver (Rowayton, CT) whose Swan 42 Blazer took home the Commodore’s Trophy last year for best corrected time in IRC. The Swan 42 Class has designated the race as part of its 2014 Offshore Championship Series. “The class doesn’t get to race offshore together very often, so we are definitely looking forward to it,” said Culver. For that very reason, the race, with its Youth and Collegiate Challenges, has encouraged a new generation of sailors who want to try distance racing. “If it weren’t for the support of the Ida Lewis Yacht Club I probably wouldn’t have made the transition to big boat sailing at all,” said 15-year-old George Moss (New York, NY), one of 17 juniors in last year’s race. “I usually race 420s, but last year I was also part of Ida Lewis Yacht Club’s Big Boat Program, which opened me up to a whole different type of racing. I competed in the Ida aboard the Class40 Icarus Racing, which served as Ida Lewis Yacht Club’s Youth Challenge entry,” said Moss, who plans to compete again this year. Last year, the New York Yacht Club and Oakcliff Sailing Center also fielded teams for the Ida Lewis Distance Race Youth Challenge. The Youth Challenge, which requires that more than 40% of the crew must have reached their 14th birthday but not turned 20 before August 15, 2014, encourages teams to register under the burgee of a US Sailing yacht club or community sailing program. The Collegiate Challenge similarly requires that more than 40% of the crew must not have reached age 26 by August 15 and encourages registering under the burgee of a college sailing program, a US Sailing yacht club or community program. Last year, Massachusetts Maritime Academy’s Andrews 70 Shindig took line honors and won the Collegiate Challenge, receiving the William Tuthill Trophy, which honors a member of the SUNY Maritime College class of 1973 who met with accidental death at sea on the school’s summer cruise in 1972. Ceremony and dinner with family and friends on the deck of Ida Lewis YC. The Ida Lewis Distance Race is a qualifier for the New England Lighthouse Series (PHRF); the Northern and Double-Handed Ocean Racing Trophies (IRC); and the US- IRC Gulf Stream Series. For sponsorship opportunities, contact Ann Souder at anncsouder@aol.com. For more information and registration, visit ildistancerace.org, contact Race Chair Simon Davidson at RaceChairman@ILDistanceRace.org, and follow the race on Facebook, Twitter and YouTube.